Christmas party time is officially upon us, so I thought I’d compile a list of beauty saviours that can really help save the day on the day. Most of us when heading to the Christmas party are probably unprepared, it just speeds round and ends up being the next day after that big important meeting, or the day you stayed late to get things done. You have your outfit, but beauty has gone out the window, so here are seven beauty saviours that can help make your life a whole lot easier. These two products are perfect if you are really not feeling that confident on the outside, whether it’s down to redness on your face, markings, dark circles, a tattoo you really don’t want all the office to see (yes it really does cover tattoos, just check this video out) varicose veins or maybe even a bruise on your legs now you’ve got that party dress on. They are both corrective foundations, one for face and one for body and come in various colours to match your skin tone. They are sweat proof and water-resistant, suitable for sensitive skin and to be honest I’m pretty amazed by this product. It also does give you a slight bit of colour, I guess to cover up completely, but nothing crazy on the fake tan scale or anything. The foundation has SPF 35, just in case you fancy using after party time, it really is an impressive product. Just to note it’s also amazingly useful if someone draws on you with permanent marker and you have work the next day – let’s face it, it happens. Buy Vichy Dermablend at Boots. If you are after a quick tan, then Cocoa Brown is your go to. They have just released these two new instant tans, one in matte and one in shimmer, which is perfect for Christmas parties. If you had no time to tan the night before, then take this to work with your mitt and apply at lunchtime or just before you are ready to head out. There is no waiting time or washing off, it dries instantly and will give you that glow for the Christmas party. I’m always a matte girl but it’s Christmas so I’ll be rocking the shimmer for sure. Available at Cloud10. If you are wearing a very tight dress, then you may worry about sweat patches under your arm, worry no more with these secret Dandi patches. When I first saw these I couldn’t wait to try them, as especially if you are wearing a colour you know could embarrass your underarm. The Dandi patch is a small patch you apply to a clean-shaven underarm and it absorbs underarm perspiration. It will also protect your clothing, is hypoallergenic and 100% natural. The patch can be worn for up to 8 hours and should save you any embarrassing sweat patches throughout the evening. Pack of 10 is £6.99 available at www.dandipatch.com. For an instant hair fix, reach for Toni & Guy’s styling dry shampoo. This isn’t your usual dry shampoo, it adds texture and volume so you can restyle your hair. It’s also completely white markings free so won’t leave your hair covered in that white dusting other dry shampoos can leave you with. It’s clear and will get rid of any oily roots and give your hair that volume boost it needs for a party style. Check out my Prada ponytail hair video for a quick and easy party hair idea. Lee Stafford’s coconut balm is from his new Coco Loco range and is a handbag essential. Take this with you to sort out any hair dilemmas. Rubbing it between your hands turns it into an oil, great for the ends of hair, styling or ideal for creating a wet look when you just haven’t had the time to style your hair before the big Christmas party. Rub a small amount between your hands and slick back your hair, then keep adding until you have achieved the look you want. Watch my wet look hair how to video for some inspiration on this hair style. If you haven’t had time to do your nails then reach for a spot of glitter and give them a once over with Kure Bazaar’s red and silver glitter polish. It will instantly add a Christmas feel to your talons and cover up any unsightly chips too. The glitters come in all different colours and is an easy way to give your nails a quick makeover before the party. The party is over and you are finally home. It’s ok to feel like ditching the skincare routine, but I do advise to take off your make-up before bed. Reach for Simple’s cleansing facial wipes and give your face the once over. 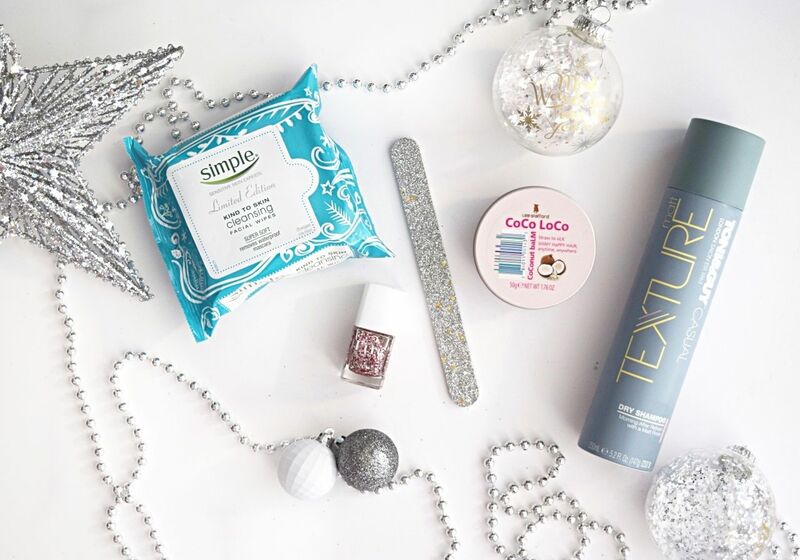 These wipes are ideal for taking off all your make-up, even eye make-up and they also have a special limited edition Christmas design, so no excuses ok? Pick them up at Tesco. Have you tried the Liz Earle superskin concentrate? Ah-mazing and a complete game changer. I’ll review it soon because I can’t believe how little there is out there about it but it’s a complete saviour for me during the winter!